absolute dedication and commitment to their craft. The first timber partial wall goes up. Flying timbers and other acrobatics. The team of six men have worked together for decades and range in age from mid-40s to mid-60s. Matt, who runs the 200-foot boom crane, gets direction from the ground where timbers are in piles. He “picks” a timber that Chris or Jim have prepared with “chokes” or strong fabric-wrapped loops that are placed precisely on the beams so that when lifted, the crane can dangle the wood in the air, and move it over and up at the proper angle to the awaiting crew. Some whole walls were assembled by the crew on the first floor “deck” then hoisted into square slots cut in the floor, later to be secured with Simpson metal straps to the carrying beams in the basement. After some of the 24 vertical posts were placed, the receiving crew of Tom. Dave, and Bill might be standing on a 29-foot high beam with hammers and pegs waiting to guide, nudge, or cajole the next timber into place. One horizontal beam got a jump assist at 20 feet from Dave and popped perfectly into position. The frame beginning to take shape. Fortunately the weather cooperated. This went on for three days. They moved gracefully around each other, swapping responsibilities or handing off tools. The intensity of the work is exhausting—even to watch. 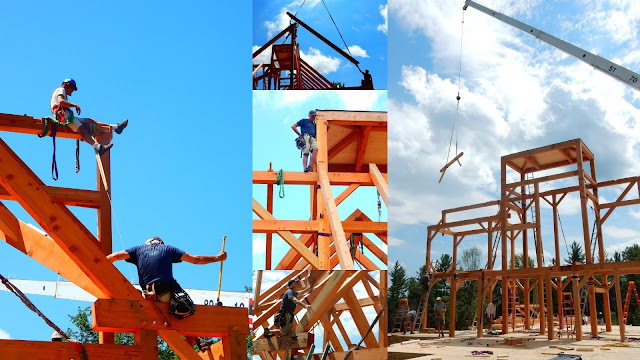 Timber framing has no room for error—in cutting the intricate joinery of a 20-foot beam or fitting it into the giant wood puzzle taking shape high above the ground. 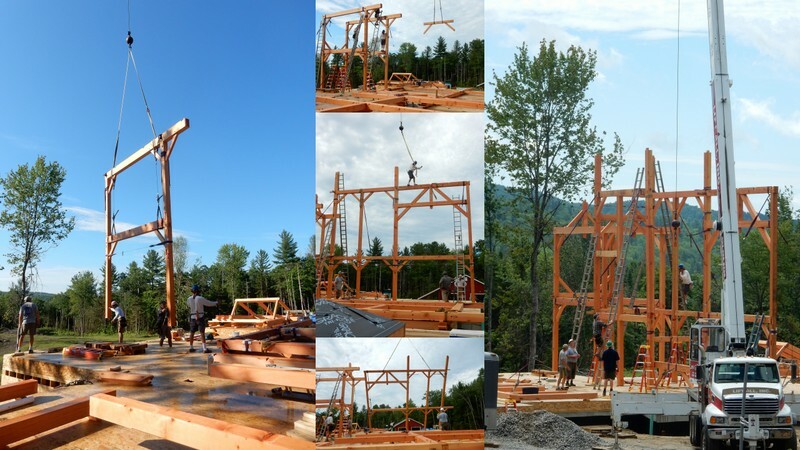 Good timber frames do not go up with ease, but with the work of our mountain crew we are very pleased. “Good timber does not grow with ease. Last week when I traveled with Mom and Doug to Alstead, NH, to meet timber framer Tom at the Timber Frame Workshop, little did I know it would be much more for me than a meeting about wood and timber frame construction. After a pleasant drive down Interstate 91 in Vermont and a few back roads back in New Hampshire, we were in Alstead in a little over an hour. In order to reach the workshop where Tom and Dave and their crew are cutting the Doug Fir timbers for the house, we drove through a pasture with 20 alpacas. Mom and Doug and Tom and Dave had to work through some details about chamfering and how the building was going to get staged. I was more interested in meeting the two dogs, the alpacas, and a few ducks. The ducks enjoy a treat. Jaime, Tom’s wife, introduced me to her charges. When I walked into the fenced-in area, the alpacas made all sorts of high pitched noises. Jamie explained that they do this when they are alarmed, in this case by me, the newbie. After feeding a few of them and gaining their trust, I was able to take some pictures. I learned many of their names (Orlando, Jack, Remmy, Miss Hollywood, and Ella Rose, to name a few) and how they are related to each other. Many were born on the farm. An alpaca can weigh anywhere from 100 to 200 pounds. Their diet consists of small amounts of protein to produce high-quality fleece. The fleece comes in 22 natural colors from brown and grey to black and the most obvious, pure white. 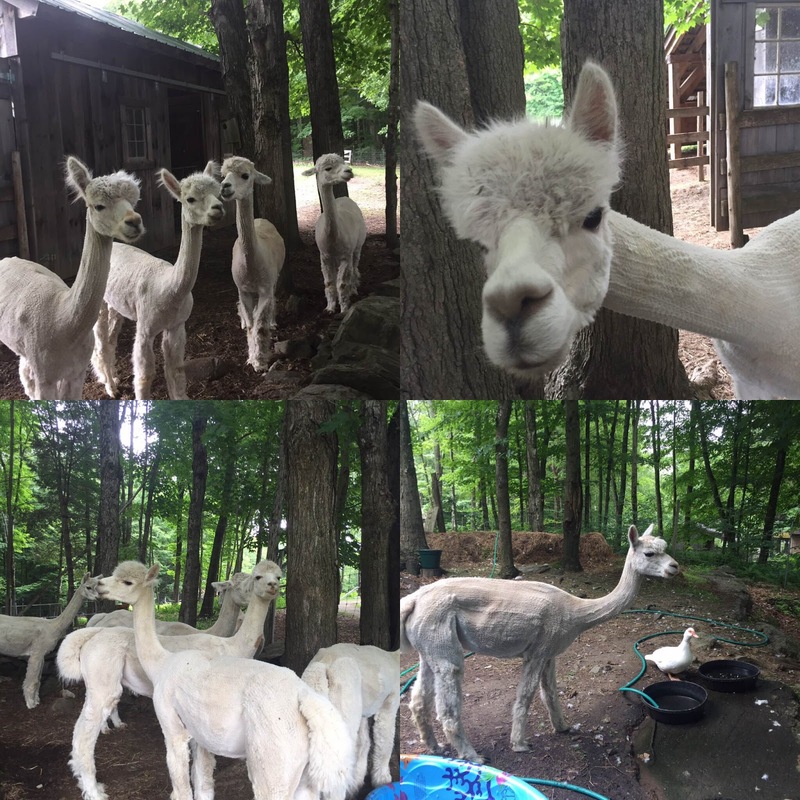 In the pictures you’ll see that the alpacas recently got shorn. Jaime makes all kinds of fiber products from the wool she gets from them. You can check out Jaime’s website for Sanctuary’s Alpaca Farm. I had a great morning with Jaime. After all, it’s not every day you get to meet an alpaca and can take a “selfie” with one—or two or three.